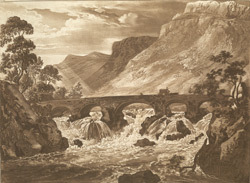 View of the large stone bridge over the falls of the River Llugwy at Pont-y-pair in Wales. Pont y Pair translates as ‘Bridge of the Cauldron’ and refers to the way that the water in the river foams as it passes over the rocks on its bed. The bridge was built in the mid 15th century and consists of four arches, each built on rocks rising from the river. The Clogwyn Cyrau mountain can be seen rising to form the backdrop for this picture.